Sign up for photo newsletter! A high vantage point is often a unique photo viewpoint! 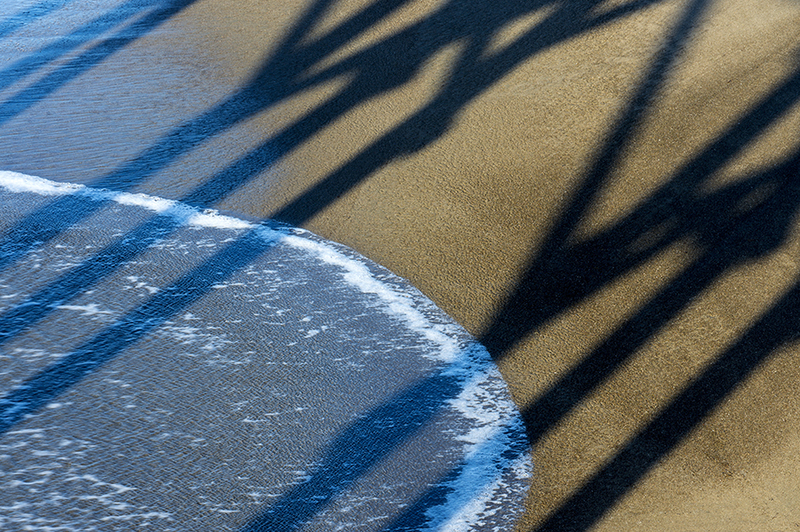 From atop a coastal pier, I pointed my camera straight down in order to catch these long diagonal lines created by the low-angled sunlight of early morning. The sudsy ocean curve also made a very nice contrasting element in this light-and-shadow show. In addition to shadows, a low sun — whether early or late day — also creates great texture in sand. – A telephoto zoom let me zero in tight on the best parts of the scene, while letting me keep out any distractions. BTW, I don’t post-crop, preferring instead to compose the image just the way I want it at the time of shooting. All the Details: Photographed at San Simeon Cove, William Randolph Hearst Memorial State Beach, California Central Coast. Nikon D4. F/22 @ 1/15th second. 100 ISO. 70-300mm lens set at 145mm. Tripod. This entry was posted in Light and Shadow and tagged Coastal Pattern. Bookmark the permalink. ← Learn to Get Creative with Your DSLR Camera!